Rhain Red-Faced (sometimes called Rhun) was the eldest son of King Brychan Brycheiniog. Despite any prior claims of his illegitimate brother, he appears to have succeeded to the Brycheioniog throne without interruption. 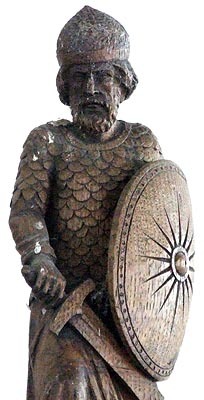 Little is known of his rule, but he appears to have been a Warrior King who, it is claimed, extended his rule over both Buellt & Gwerthrynion and Rhwng Gwy a Hafren. He certainly invaded Gwynllwg at one point, but was chased away by its people. His life alone was spared because the Gwynllwgians dare not kill the uncle of their own King, St. Cadog. When Rhain died in the late 5th century, he was buried at Llandyfaelog Fach and succeeded by his son, Rhigeneu. Some people consider him a saint. He is probably to be identified with Rhein Hael (the Generous), maternal grandfather of St. Asa (Asaph).